Since our financial institutions are in decline, what better way to honor them than by sloshing them with Red Bull vodkas and blasting them with trip hop? 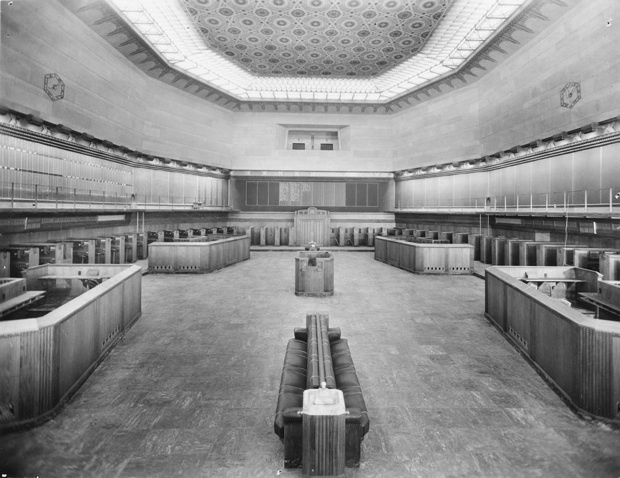 The Los Angeles Stock Exchange, a beautiful 1931 structure, reopened last week as Exchange LA, a 25,000-square-foot venue perfect for L.A.’s new economies: award shows and after parties. The “Wall Street of the West” was once home to the Pacific Stock Exchange, which had trading floors here and in San Francisco until the exchange demutualized and was eventually bought by the New York Stock Exchange. The exchange moved out in 1986. The refurbished space was designed by Karin Liljegren of Omgivning to leave as much of the original details intact as possible, including a massive antique stock trading monitor that was used to display the buying and selling of stocks for traders on the floor. The space’s grand entryway staircase was left completely intact, as was the entrance onto downtown’s Spring Street, featuring massive 12-foot solid bronze doors that weight 1,400 pounds each. Relief sculptures on the buildings’ granite exterior feature capitalist icons for finance and manufacturing. 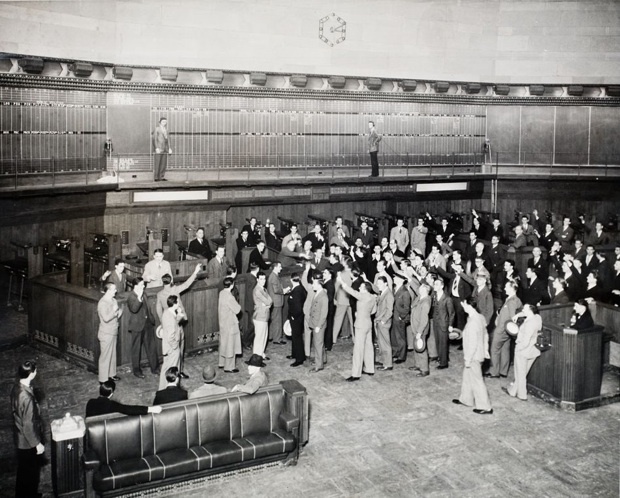 A row of booths where stock exchange members once sat and calculated profits has been converted into a bar where new the only digits being manipulated are on mobile devices. From the looks of things people are already really enjoying Exchange LA’s state-of-the-art sound system. Look at those people dancing in the balconies!